The Ethnomir cultural-educational centre hosted VegFest, where gurus of healthy lifestyles from all over the world educated visitors on the benefits of a vegetarian diet and practising yoga. In the heat of the hot summer days in the hectic city, it would be a breath of fresh air to plunge into a completely different, new world of harmony with oneself and nature. VegFest 2013, an international vegetarian festival held in the cultural-educational center Ethnomir on July 22-28, was a perfect chance to do just this. This was the fourth time the festival was held, so the majority of visitors knew what to expect. Gurus and masters of healthy lifestyles from all over the world came here to find followers, educate beginners and share their experiences. The possibilities at VegFest were truly fascinating. Everyone could choose from something of interest to them — from master classes in raw food dieting and personal yoga training, to cultural performances and lectures on the benefits of becoming a vegetarian. One of the most important figures at the festival was Manish Jain from Vegan Education Center. Along with his wife Neena Jain (who also taught yoga at the event) and his daughter, Manish came from India especially for VegFest 2013, to tell people about veganism. He is a lifelong vegan and has never eaten anything made of animals. “It is terrible to see all these factories and farms where people raise these animals to be killed. These people have to understand simple theses: You won’t miss anything being vegan, you’ll be healthier if you didn’t eat meat, veganism will help to solve environmental problems and, the most important thing, people must have a connection to what they are eating. Who are we to kill living beings, if they exist just like we do?” said Manish. In addition to theoretical demonstrations of the advantages of vegetarianism, practical classes were available at VegFest too. People had the chance to try vegetarian food from a variety of health-conscious restaurants and cafes like Ivan-Chaynaya, Ivan-Lapsha, the Indian restaurant Namaste, and the Thai restaurant Fuji-San. For those who wanted to learn how to cook tasty vegetarian food for themselves, special master classes were organized, where experienced vegans and vegetarians taught recipes and interesting tips to all comers. In addition, special ingredients, delicacies and other rare items could be bought at VegFest’s Green Market. 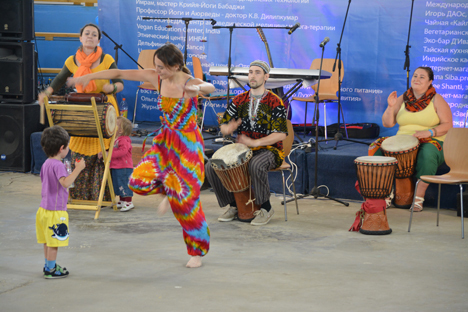 Among other things, VegFest was full of all kinds of various cultural performances and experiences: Everyone was able to attend different kinds of yoga led by famous teachers, special meditation classes like Tibet Healing Graal, or even master classes in different kinds of ethnic dances. Of course, visitors could also just watch these professionals perform their best onstage. Alexander, instructor of the cultural center INBI in Moscow, came here for his second time and was very pleased with his visit: “Everything in Ethnomir is completely different — the atmosphere, the people. We would be very happy to come here the next time.” He also noted that this was a wonderful place to find like-minded people. Some people who visited INBI’s master class last year have become the center’s followers back in Moscow. As for accommodations for festival-goers who wanted to stay for more than one day, only options close to nature were made available: They could live in replica Slavic izbas and yurts, or in a tent. This is not the first time Ethnomir has hosted such an event. Almost every weekend there are different interesting festivals and celebrations at the center — like the famous Wild Mint festival, for example. The convenient location, interesting programs and inexpressible atmosphere make the center a perfect chance for escape from the everyday, hectic urban existence.